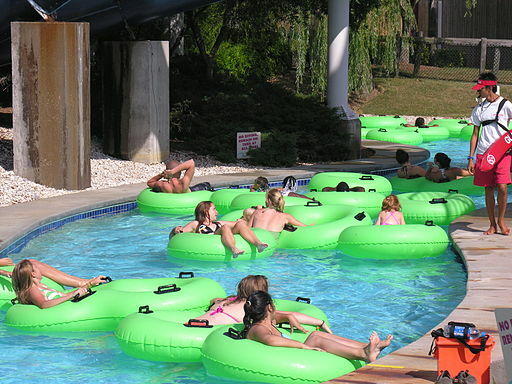 Lazy rivers are the best (Wikimedia Commons/Christine Schmidt). Originally posted on The Sieve. I love water parks. The slides, the wave pools, the smell of sunscreen, the funnel cakes, and above all the lazy rivers. A good water park will always have a soft spot in my heart. That’s why when I first learned of a water park in South Africa called Sun City that seemed to be propagating a myth that an ancient civilization of European origin had built a great lost city in the region, I was a little shocked. In my 10th grade world history class, we watched a documentary about the real ancient ruins of Great Zimbabwe, an archaeological site with a controversial past, and its final images were of children frolicking at Sun City. The innocence of my childhood spent in inner-tubes clashed with this bizarre message that frankly sounded…kind of racist. The myth begins with bad archaeology. Built between 1200 and 1400 CE, Great Zimbabwe once served as the capital of a complex local civilization in southeastern modern Zimbabwe. Its stone enclosures with walls up to 30 feet high were built without mortar and adorned with soapstone bird sculptures. The hilltop palace and surrounding city covered about 1800 acres, and could have housed more than 10,000 people. Untouched by European influence, Great Zimbabwe probably looked pretty impressive, rising above the grassland. These people weren’t isolated. Excavations of the site turned up gold working equipment, ironware, pottery shards, Arab coins, Chinese porcelain, and Persian beads. Second hand stories from Arab traders eventually made their way to the ears of Portuguese explorers. Some thought it was Ophir, a biblical city built by the Queen of Sheba, or the seat of a mythological Christian ruler called Prester John…or even the location of King Solomon’s legendary mines. By the time Karl Mauch, a German Indiana Jones type, showed up in 1871, the city had been abandoned, likely due to famine around 1500. Mauch came in with a preconceived notion that these were ruins of a civilized society. And let’s not beat around the bush here, by civilized, he meant white. Since fragments from a cross beam at the site matched the red hue of his pencil, he thought they were cedar from Lebanon. In this line of logic, he ultimately hypothesized that the Queen of Sheba called Great Zimbabwe home. 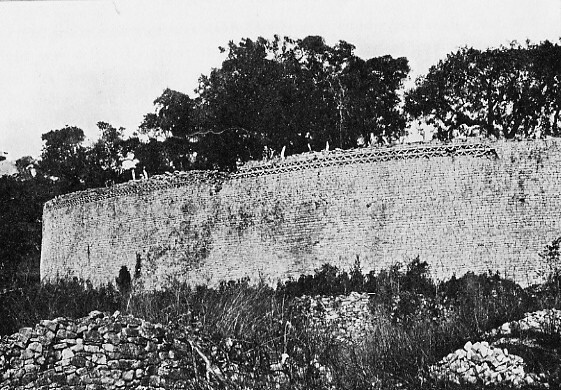 Great Zimbabwe, view of southeast wall of Great Enclosure taken in 1906 by Randall MacIver. (Wikimedia Commons/PD-1923). Bent’s successor was even worse. Instead of preserving the site, local journalist Richard Nicklin Hall dug up a 3 to 12 foot layer of archaeological evidence across the site, under pretense that he was removing “the filth and decadence of the Kaffir occupation”. He disregarded stratification and even disposed of artifacts. Hall’s efforts and local looting left little behind for future researchers to analyze. David Randall McIver, the first to scientifically excavate the site from 1905 to 1906, concluded that the mud dwellings within the stone enclosures were definitely African in origin and dated to the middle ages. In 1929, data from archaeologist Gertrude Caton-Thompson (no relation) backed up McIver’s claims and pegged the cite’s settlement at 1100 CE. You’d think that would have been the end of it. Not so. Scholars went on to propose evidence of Indian or Malaya inhabitants. In the 1960s, the Rhodesian government suppressed archaeological theories of indigenous black settlement — any papers that suggested an African origin had to equally address the possibility of Phoenician or Semitic builders. Around the same time, liberationists saw the site as a symbol of African Nationalism and later chose to rename Rhodesia in its honor. In 1973, archaeologist Peter Garlake finally put the myth to rest when he wrote the definitive book on Great Zimbabwe — founded by not by whites, but by black Africans. So, by now you’re asking where does the water park come in? Sun City is a footnote to the larger saga of Great Zimbabwe. Built in 1979 before the fall of Apartheid, the water park is part of a larger resort and casino complex outside of Johannesburg. Though I’ve never been, Sun City popped up in my life again last spring. This time in the security line of the Joburg Airport; the biologist behind me happened to be heading there for a scientific conference. Today, the hokey premise of the resort still centers on the “fairytale” of a lost tribe that build a great city in the region — presented as fantasy, not reality. So, in this weird way, the myth persists. Archaeologists do still debate Great Zimbabwe’s origins. But, today, it’s a matter of which African tribe actually settled the area and why. I was really hoping this was going to be about an ancient water park. If only…. Haha sorry to disappoint.